I like advice. Probably because I am curious and there is no way to experience everything for myself . I figure that it’s OK to get pointers from everyone I can. I got a little nugget of gold from one of my friend’s mothers. We were downstairs in their basement, and the guys were playing pool. His mom offered me a beverage and of course I accepted. We walked over to the basement fridge and she pulled out a cold one for me and we gabbed for a bit. Eventually I finished up and asked her where to put my empty can for recycling. While I love the idea, I haven’t quite picked up the ironing and beer combo as my own (yet) but I took her advice to heart. 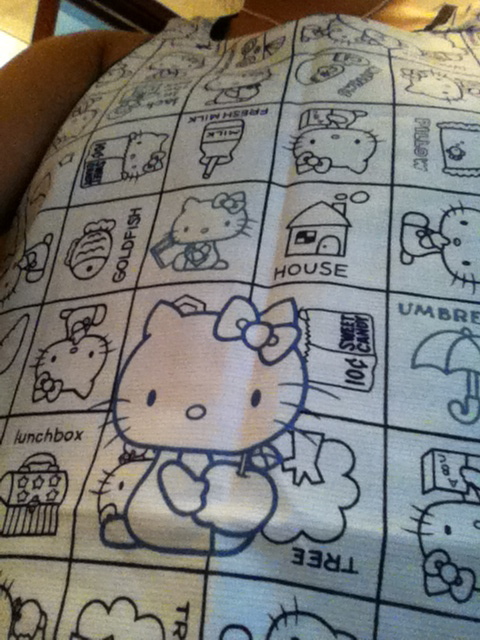 Now, when I clean the apartment, iron, or do the dishes, I wear this cute little Hello Kitty apron and it makes things more enjoyable. A mere $18 HK ($2.32 USD) well spent. She’s right, everything should be enjoyable on some level. Is hello kitty all your wearing? Sorry, had to make the joke. Is hello kitty all your wearing? Sorry couldn’t resist the joke.